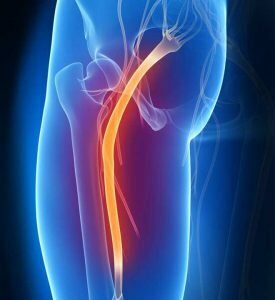 Sciatica, description and how IDD Therapy can successfully resolve it. Many people suffer from Sciatica, also called Sciatic Neuritis. It can be as mild as a small ache in the lower back or as intense as numbness and/or pain which travels down the leg to the foot. The sciatic nerve is a combination of a group of nerves that come together to form one big nerve. This nerve is about the size of the little finger and runs all the way down to the feet, branching off to supply muscles and other tissues. The sciatic begins around the third lumbar vertebra and has branches which innervate the fourth and fifth vertebra and Sacrum. Due to the length and path of this nerve, it is subject to many different stresses. Some are muscular, in which the muscles (usually the hamstrings) get very tight and strangle the nerve. Other times, the holes where the roots of the nerve exit the spine get closed off (as in a degenerated spine) or the nerve gets pressure on it (from a herniated disc). IDD Therapy® treatment helps to alleviate sciatica by insuring proper disc height and alignment of the spinal segments involved. When the pressure and stressors are removed, the nerve can repair itself and the pain subsides.